Let's talk about what tools you need to start your fruit carving business. This question arrised from a blog's visitor. I will answer it and put my thoughts and recommendations here. I suppose that you already have tools and knives for carving. The question is about picking good tools those will serve you well. Because you will have to do lot of carving works as soon as you become receiving orders. The knives must be well sharpened and made of good metal, with a convenient handle. In other words the tools should be for professional using. I recommend you to choose the professional tools I myself started with in 2007, Triangle Tool Set. 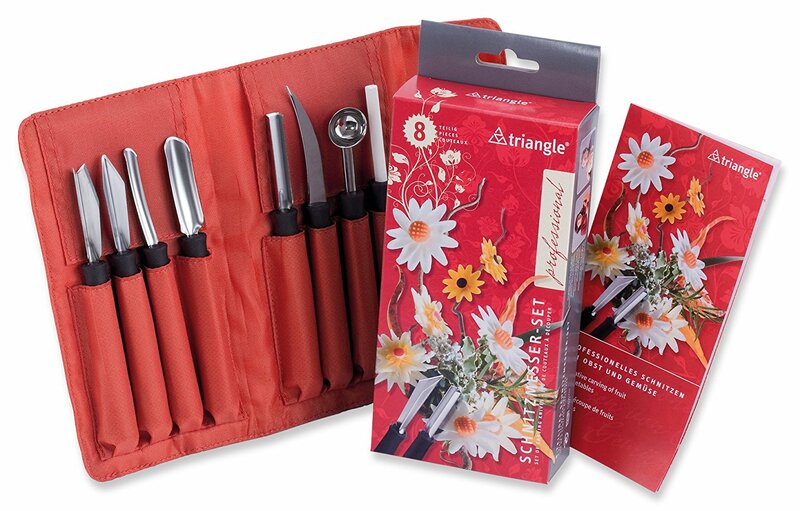 The "Triangle" company is Germany based family company specialized on kitchen knives and supplies. Now they are known in Europe, Russia, the USA and Japan. You may come across the famous carving artists who use the Triangle knives for work, for classes and for fruit carving demo at the FOOD EXPOs. Some of my fruit art colleagues in the world have been contracted by the company to present the Triangle tools on TV and Internet. I use Triangle tools and knives from the beginning of my fruit carving career back in 2007. I use the tools for making my fruit arrangements. To me, the Triangle tools give lots of inspiration and possibilities to create. I implement a teaching method based on the tools usage. THE RESUME: With the Triangle tools you are able to create worth watermelon carving designs, nice and neat fruit and vegetable carving centerpieces at the money-making level. I will give you a list of tools and knives you need for fruit carving business. 1. Thai knife. This is a name for a specially designed type of knife used for Thai carving. Thai knife is a basic must-have tool. 2. U-knife and V-knife. The knives are called after the shape they have. These knives do U and V cuts on a watermelon or other product, usually used for carving different types of flowers and designs when combined. These kind of knives is produced in different sizes. Can be wavy as well. Must-have knives. 3. Melon baller. This is a name for a tool that looks like a ball spoon for icecreame, but smaller. The tool carves balls out of watermelon, melon, papaya, apples, kiwi, vegetable, butter and many other products you can try this tool on. The tool is produced in different size ranges. A must-have tool. 4. Crinkle (or wavy) knife. The tool cuts wavy slices of whatever you use it on. Must-have tool for plating art and fruit buffets. 5. Paring knife. A big paring knife is necessary for cutting massive fruits as watermelon, melon, pumpkin. I recommend you to have a big and small paring knives for different types of fruit. 6. Peeler. A must-have tool to skin fruits and vegetables and make simple garnishes. 7. Toothpicks and skewers. You will need them to provide a secure attachment of the details in your carving displays, fruit bouquets and other edible arrangements. This is the list of the must-have tools in my kit. If you look through the blog posts with my fruit carving displays you will find the notices about using tools for the certain carving designs. There are more extra tools you may want to have and of course you need them too, are slicers, spiral slicers, cookie cutters etc. A fruit bouquet maker may need a number of baskets and flower pots to arrange fruit bouquets in. If you make fruit carving arrangements for events as wedding receptions, baby showers and birthdays, and your fruit creations are supposed to be displayed at the head table or fruit/candy bar, you may need to have glass or wooden stands , vases and kind of fruit holders, in order to set up things nicely at different heights, and to save space on the table. 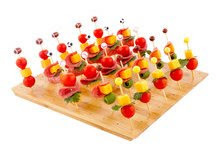 When you do food catering and give fruit carvings to garnish a fruit buffet or a chocolate fountain, you may need a range of bowls, platters, stands for finger food and fruit kebabs presentation. I know that it's good for business to have the necessary things available any time when you need them. I also know that fruit carving business depends on many things like a season, market demand, economic situation, and finally it depends on your entrepreneur skills and your wish to be in the business. I don't think it's a good idea to buy a large batch of the kitchenware in the beginning of your business to make a provision for years. I recommend you to find a solution with kitchenware suppliers, shops or stores where you can buy a small amount of the suitable platters, vases and holders at good price. For example, I used to use the special watermelon plates with pins for watermelon carvings and fruit sculptures. The plates allows a secure transportation of the fruit displays. Later I found another solution and started using cake stands for watermelons and disposable cake cardboards for fruit platters. A good professional tool set helps you create professionally looking carving displays and garnishes. A good knife is your reliable business partner. Be wise in spending money, buy good tools which you will use for years (I use my Triangle tool set for 10 years already). Have some extra new tools to sell at the exhibitions and during carving demo. It is a good business. how i can get it knife carving?